Photochromic fibers and fabrics can change color in response to light radiation. They represent a smart textile having attracted much attention recently and showing potential applications in diverse areas. This review chapter gives an overview of the state-of-the-art techniques for the preparation of photochromic fibers and fabrics. The properties and applications of photochromic fabrics are also discussed. The fascinating color change of photochromic compounds in response to specific light has led to a number of applications in areas including light protection, ophthalmic lenses, security printing, optical data storage, memories, optical switches, sensors, and displays. In recent years, interest has also risen in the development of fibers and textiles with photochromic features mainly for fashion and UV protection purposes. This chapter summarizes recent research progress in photochromic fibers and fabrics and their optical properties and applications. The basic principle of photochromism, the preparation methods of photochromic fibers and fabrics, and the future perspectives of these smart fabrics are also discussed. Photochromism is defined in simple terms as a reversible light-induced color change . A more accurate definition would be a reversible transformation between two forms of a chemical compound with different absorption spectra, caused in one or both directions by electromagnetic radiation. The reversibility of the reaction is stressed upon [1, 2, 3]. A typical photochromic reaction is given in Fig. 1. Form A, which is the more thermodynamically stable state of the photochromic molecule, is transformed into form B by radiation. This reaction can be reversed thermally or photochemically . If the back reaction occurs thermally, the process is referred to as T-type photochromism, and if driven only by irradiation with light (other wavelengths than UV), it is known as P-type photochromism [1, 4]. Photochromic reactions can also be categorized in another way. The most common photochromic processes are known as positive, where form A is colorless and form B colored. In some compounds, however, negative photochromism is observed, where form A is colored and form B colorless. In addition to the color change, the change in the molecular structure of the photochromic compound may lead to changes in its physical properties such as refractive index, electrical conductivity, and solubility [5, 6]. Photochromism was first reported in the literature by Fritsche in 1867, who observed a color change in tetracene in the presence of light, and later by ter Meer in 1876, who observed this phenomenon in the potassium salt of dinitroethane. Later, Phipson reported that a gate post (covered with a zinc pigment) appeared black in daylight and white at night. Marckwald identified the color change behavior of benzo-1-naphthyridine and tetrachloro-l,2-keto-naphthalenone in the presence of light as a new phenomenon and named it “phototropy.” Nowadays, this term is used to describe the behavior of plants towards light. The term “photochromism” was suggested by Hirshberg in 1950. It consists of the Greek words phos meaning light and chroma meaning color and is a more accurate term for describing a reversible color change. Before 1921, most studies on photochromism were focused on synthesis and properties of photochromic molecules (e.g., bleaching and fatigue). A decline in the study of this phenomenon occurred in the 1930s. Photochromism came back to attention in the 1940s. This time, however, the focus had shifted towards the mechanism of photochromic processes, the structure of photochromic molecules, and the intermediate species formed in the photochromic reactions. These studies benefited from technological advances, as such characterization tools as nuclear magnetic resonance (NMR) and infrared (IR) spectroscopy became available. The introduction of photochromic sunglasses was a breakthrough in the 1960s. The discovery of time-resolved spectroscopy made it possible to study transient processes and excited states and their lifetime and properties. More recently, some typical photochromic compounds such as fulgides and spiropyrans were thoroughly investigated, and novel photochromic compounds such as spiroindolizines were discovered. In recent years, embedding photochromic molecules in polymeric or other matrices has attracted great interest. Figure 2 shows the rapid growth of the research literature on photochromism since the 1990s. Most of the studies have been conducted in the chemistry area, followed by physics and materials science (Fig. 3). Other areas include crystallography, optics, and polymer science. Photochromism is still an inviting field of research, and further investigation could help to develop exciting new applications . Photochromism is observed in organic as well as inorganic or organometallic materials. Examples of inorganic materials exhibiting photochromic properties include metal (e.g., silver) halides, metal oxides, titanium oxides, alkaline earth sulfides, and some natural minerals and transition metal compounds. Examples of organic photochromic materials include hydrazones, osazones, semicarbazones, anilines, disulfoxides, succinic anhydride, spiro compounds, and derivatives of stilbene, camphor, and o-nitrobenzyl. The photochromic processes of organic compounds mostly involve heterolytic cleavage, isomerization, pericyclic reactions, and to a lesser extent redox or electron transfer. Among the photochromic dyes developed, spiropyrans, spirooxazines, naphthopyrans, diarylethenes, fulgides, and azobenzenes are the most widely known classes [2, 3, 6]. Photochromic materials are also categorized as T type or P type based on whether the back reaction occurs thermally (T) or photochemically (P). T-type photochromic compounds include spiropyrans, spirooxazines, naphthopyrans (chromenes), and azobenzenes. P-type photochromic materials include diarylethenes and fulgides [1, 2, 7]. Spiropyrans (SPs) are the most widely studied families of photochromic dyes. They are easy to synthesize, exhibit high color depth, and bleach rapidly. Their photochromic reaction involves opening the pyran ring upon UV exposure, leading to a colored form called photomerocyanine (Fig. 4). The colorless and colored forms of SP are both present at all times and in equilibrium with each other. UV irradiation shifts the reaction in Fig. 4 to the right, that is, towards generation of the merocyanine (MC) species, which produces a deeper color. In the absence of UV irradiation, the reaction is reversed to produce higher concentrations of the colorless species, thus color bleaching. As heat can shift the equilibrium towards the ring-closed, colorless pyran form, elevated temperatures can increase bleaching speeds, reducing the photochromic effect . The shortcoming of the SP family is their relatively low resistance to fatigue. However, they are still used in applications that do not require high photostability, for instance, as probes or controls, in tensile stress sensors, and in photo-switchable magnetic devices . This class of photochromic dyes is similar in its structure and photochromism mechanism to spiropyrans. However, it is superior to spiropyrans in terms of photostability. Because of the relatively high fatigue resistance, spirooxazines were used in the first commercial plastic photochromic lenses. Simple spirooxazine compounds have a blue shade in their excited state and bleach relatively quickly. Their shade in the excited state, as well as their photo-coloration/bleaching, can be tailored by introducing suitable functional groups to the molecule . The chemical structure and photochromic reaction of a typical spirooxazine compound is shown in Fig. 5. This class of photochromic compounds, also known as chromenes, has become the most important in commercial applications. This family of dyes also undergoes a ring-opening transformation when irradiated by UV light (Fig. 6). The chemical structure of naphthopyrans allows the economical incorporation of many types of substituents to tailor photochromic color, kinetics, and stability. The photostability of commercially available naphthopyrans is comparable to other classes of photochromic dyes. Furthermore, they are less heat sensitive compared to spirooxazines. This is why it has been used in the formulation of all marketed plastic photochromic lenses [4, 8]. Diarylethenes (with heterocyclic aryl group) belong to P-type photochromic dyes. In other words, their photochromism is thermally irreversible. Furthermore, diarylethenes exhibit high levels of fatigue resistance. They can undergo coloration/bleaching more than 104 times, which makes them suitable for applications in optical devices such as memories and switches . Diarylethenes undergo a ring-closing reaction when stimulated by UV light . The open form is thermally stable, while the thermal stability of the closed form depends on the type of aryl group. The ring-closing process of a diarylethene is shown in Fig. 7. Figure 8 shows the spectral changes of a diarylethene compound during conversion between open and closed forms. Fulgides exhibit photochromism with the same mechanism as diarylethenes, i.e., photocyclization. In other words, UV light triggers a reaction which converts the open colorless form to the closed colored form . The photochromic reaction of a fulgide is shown in Fig. 9. Fulgides belong to P-type photochromic dyes. This means that once activated, fulgides tend to remain in their closed-ring, colored state, unless they are irradiated with visible light. This feature facilitates the application of fulgides in optical memories and switches. Furthermore, unlike spiropyrans and spirooxazines, fulgides can perform photochromic reaction in their solid form . Azobenzenes follow a trans-cis isomerization photochromism (Fig. 10). The trans form is commonly referred to as “E” and the cis form as “Z.” Azobenzenes are thermally reversible, meaning that the Z isomer can transform to the E isomer by means of heat (or visible light). Azobenzene compounds generally have a yellow to red color . Exhaust or batch dyeing is a common discontinuous process for dyeing textiles. In this process, the dye slowly transfers or exhausts from a relatively large dye bath to the textile. The dye bath is heated where higher temperatures are required. The textiles in any form, including fiber, yarn, fabric, or garment, can be dyed using this method . The way of using dyeing method to prepare photochromic fibers or fabrics is straightforward. Shah et al. dyed nylon, cellulose triacetate, and polyester fibers with mercury (II) dithizonate photochromic compound. The dyeing solution was prepared by mixing the dye with dispersing agent and wetting agent. The nylon and polyester fibers were treated at a pH of 5–6 at 60 °C for 15 min. Polyester fibers were dyed under high pressure at 120 °C for an hour at a liquor-to-goods ratio of 50:1. Nylon and cellulose triacetate fibers were dyed at 100 °C for 1.5 h. The fibers were then washed with water, a solution containing soap (1 g/L) and sodium carbonate (2 g/L) to remove excess dye, and water again before drying in air. The fastness of the dyed fibers, including photostability, and wash and abrasion fastness were all measured according to standardized methods . The color of the cellulose triacetate and nylon fibers changed from orange/brown orange to blue gray/violet with exposure to strong sunlight. The decoloration at room temperature took between 30 and 45 min and was fastest in polyester fibers. The decoloration took around 2–3 min at 100 °C. The three fibers displayed excellent photochromism as well as satisfactory photostability and superior wash and abrasion fastness. Lee et al. incorporated three spirooxazine dyes in polyamide fabrics using an exhaust dyeing process. The fibers were dyed in a dyeing machine at a liquor-to-goods ratio of 50:1 at 40 °C for 10 min and subsequently at a temperature between 80 °C and 120 °C for 1 h. The samples were then rinsed with water and air-dried. The dye exhaustion yield was found to increase with increasing the dyeing temperature (Fig. 11). This was attributed to swelling of the fibers at higher temperatures which facilitates the diffusion of dye molecules into the fibers. It was also attributed to the higher kinetic energy of the dye molecules at elevated temperatures. The dyed polyamide substrates before and after UV irradiation are shown in Fig. 12. The conventional exhaust dyeing technique was also employed by Billah et al. to prepare photochromic acrylic, nylon, and polyester fabrics. The photochromic fabrics, depending on the dye used, displayed a blue or bluish-purple color under UV irradiation. The nylon fabric showed a deeper color than the acrylic fabric. The dyes were ball milled with a dispersing agent and water, and the resultant dye dispersions were added to the fibers in a dyeing machine. A pH of 5.5 was used in the dying bath for nylon and acrylic and 4.5 for polyester. The liquor-to-goods ratio was 50:1. The starting temperature was 40 °C, which was gradually increased to 90 °C and maintained there for an hour. The temperature was then reduced back to 40 °C and the fabrics were rinsed with water. They also applied acidic photochromic dyes to wool fabric . Aldib and Christie  also applied six photochromic dyes of spironaphthooxazine and naphthopyran types to a polyester fabric by means of exhaust dyeing. Screen printing is a technique where a dyeing paste is passed through a screen using a blade to form a pattern on fabric. Manual, mechanical, and rotary screen printing can be used for treatment of textiles . Little and Christie  screen printed commercially available photochromic dyes onto cotton fabric. Feczko et al. also used the screen-printing technique to apply ethyl cellulose–spirooxazine nanoparticles to cotton fabric. To protect the photochromic compounds, microencapsulation was used for incorporating photochromic compounds. Due to the small size of the resultant microcapsules (approximately 3–5 μ), microencapsulated photochromic dyes can be screen printed onto fabrics . The advantage of this technique is that the encapsulating polymer layer offers a protection to the photochromic compounds. However, it reduces the fabric handle properties. Sol–gel technology is in general terms a method of producing inorganic materials by way of synthesizing a sol, causing it to gel, and subsequently drying and possibly sintering the gel. This process offers the possibility of fabricating materials with tailored properties in a range of forms including powders, fibers, and films, by selecting suitable precursors and controlling the reaction conditions . Sol–gel process enables the control of pore size and pore arrangement in the inorganic or hybrid matrix . R represents an alkyl group and •OR an alkoxy ligand. If amounts of water and catalyst are sufficient, the four alkoxy groups are converted to hydroxyl groups, producing Si(OH)4. Otherwise, the hydrolysis reaction stops in an intermediate stage, leading to Si(OR)4−n (OH)n.
Sol–gel process also includes condensation reactions, which occur when partially hydrolyzed metals/metalloids interact. The by-product of the condensation reaction could be water or alcohol, as in Reactions 2 and 3, respectively. The condensation reaction polymerizes the monomer into a larger structure. A gel is formed when a monomer molecule grows into a macroscopic-size polymer covering a large area of the solution. Therefore, a gel can be described as a continuous solid framework within a continuous liquid phase. A sol may be applied onto various substrates to form a uniform coating. Cheng et al. [24, 25, 26] used silica sol–gel to encapsulate photochromic spirooxazine dye on wool fabric. The procedure is shown in Fig. 13. The precursors used as well as the photochromic properties of the coated fabric are shown in Table 1. 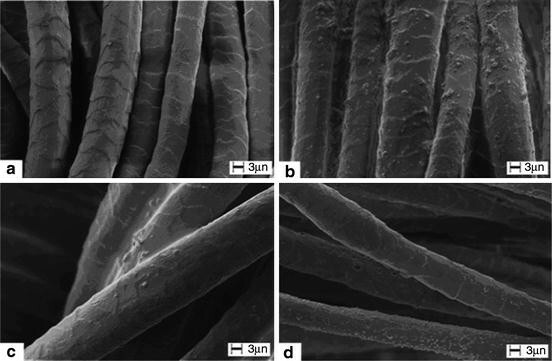 Figure 14 shows SEM images of the wool fibers before and after sol–gel treatment, abrasion, and wash tests. The colorless spirooxazine dye turned blue when exposed to UV irradiation. The color change of the photochromic wool fabric with exposure to sunlight is illustrated in Fig. 15 . Cheng et al. reported the absorption maxima of 0.24 and 0.25, coloration half times of 14.75 and 9.30 s, and bleaching half times of 54.25 and 22.75 s for silica coatings from phenyltriethoxysilane (PhTES) and octyltriethoxysilane (OTES), respectively. Furthermore, they reported values of 38.16 % and 37.31 % for the wash fastness of PhTES and OTES sol–gel-coated fabrics, respectively. 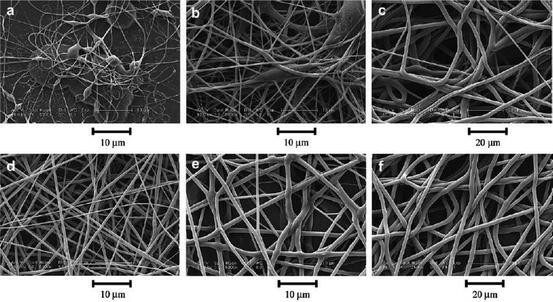 Electrospinning is an efficient method to prepare polymer nanofibers. During electrospinning, a polymer solution is charged by a strong electric field to create a polymer jet that solidifies upon rapid solvent evaporation from the jet during electrospinning. These charged fibers are collected on the counter electrode . When functional chemicals are added to polymer solution for electrospinning, they are incorporated into fibers and spun easily. In this way, photochromic nanofibers can be produced by adding photochromic dyes to a polymer solution for electrospinning. De Sousa et al. incorporated a spiropyran–cyclodextrin complex into PMMA nanofibers through electrospinning PMMA solution containing photochromic dyes. Spiropyran was covalently bonded to β-cyclodextrin and the resulting complex was attached to the side chain of PMMA. For comparison, spiropyran alone was also attached to the side chain of PMMA. The hydroxyl groups on the outer surface of cyclodextrin stabilize the merocyanine (colored) form of spiropyran. On the other hand, although PMMA polymer also contains hydroxyl groups, the presence of hydrophobic groups in PMMA as well as limitations on free movement of spiropyran in PMMA matrix causes the stabilization of the colorless form of spiropyran. Therefore, the combination of β-cyclodextrin and PMMA leads to a balanced coloration–decoloration rate. The electrospun fiber mat was kept at 80 °C for 12 h while subjected to visible irradiation through a mask. Once the mask was removed, the covered area of the mat was light red, which is related to the merocyanine form of the dye, while the area that had been exposed to visible light was white, which is related to the colorless form of spiropyran. Once the mat was exposed to UV irradiation, the color difference between the two areas increased due to the fluorescence of the merocyanine form. Bianco et al. added a diarylethene dye to the solution of polyamide 6 (PA-6) and formic acid for the preparation of electrospun photochromic fibers. They used polarized infrared spectroscopy to study the alignment of the PA-6 polymer chains in the fibers and found that the molecules of the dopant, i.e., photochromic dye, in the fiber were also highly aligned. Kim et al. produced nanofibers by incorporating photochromic pigments into the electrospinning feed solution and fused the nanofibers to produce a photochromic nonwoven fabric. Di Benedetto et al. incorporated a spiropyran into a PMMA polymer matrix to produce photochromic electrospun nanofibers. 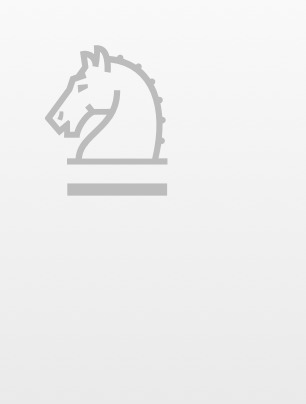 They observed photo-switchable wettability on the photochromic nanofiber mat. In other words, it changed with the irradiation wavelength. Wang et al. produced photochromic nanofibers by electrospinning the solution of a spiropyran and polyvinylidene fluoride–hexafluoropropylene copolymer (Fig. 16). The color change of the nanofiber mat with exposure to UV and visible light is shown in Fig. 17. Figure 18 shows the level of optical absorption of a photochromic textile under UV irradiation. Without UV light, no absorption peak is formed in the wavelength region between 600 and 650 nm for spirooxazine. When the fabric is irradiated by UV light, an absorption peak appears. The absorption intensity reflects the color depth of the fabric; the higher the intensity value, the deeper the color. The depth of color upon UV irradiation is a significant factor in real-life applications of photochromic textiles. Little and Christie  found that photochromic spirooxazine dye printed on cotton fabric produced a stronger color with UV irradiation than on polyester. They attributed this to different UV reflection from the surface of the two fabrics. Cotton reflects UV irradiation more than polyester, which results in the printed layer on cotton being exposed to reflected UV light, thus increasing the degree of photo-coloration. The strength of photochromic color is dependent on dye concentration. Little and Christie  observed a stronger color with higher dye concentration up to a maximum level. They explained this as the reduction in dye solubility in the printing paste after a certain point. As the photochromic compound does not display photochromism in its solid form, the degree of photo-coloration is reduced. Dye aggregation was also proposed as a possible explanation, as it hinders the structural transformation of the dye molecules which requires free space. A third explanation offered was that the absorption of UV light by the dye molecules in the upper layers of the print blocks the UV from those in the lower layers. The dyes studied by Little and Christie  showed different degrees of photo-coloration based on the wavelength of UV light. They found that the photochromic color change was mainly initiated by UVA (360–390 nm). UVB (290–320 nm) followed by UVC (220–290 nm) was less influential in the color change of the dyes. Temperature can also have an impact on the degree of color change or photo-coloration. Increasing the temperature can promote the photochromic back reaction, thereby hindering color change . Additives can also affect the UV absorption of a photochromic fabric. Feczko et al. reported that adding a photo-stabilizer compound, Tinuvin 144, to the screen-printing paste improved the photochromic absorbance of their cotton fabric. Billah et al. reported that the UV absorption of nylon, polyester, and acrylic photochromic fabrics wetted with water as well as other solvents was significantly higher than that of the dry fabrics. They observed that wetting polyester fabric with acetonitrile, which was the most polar solvent among the five studied, produced the highest UV absorption, while toluene which was the least polar contributed to a smaller UV absorption. They calculated the dipole moments of the photomerocyanine (open form) and closed form of the dye and observed that the photomerocyanine species has higher polarity. Therefore, the more polar solvents stabilized the open form of the dye molecule, thus promoting photo-coloration. However, there was no obvious correlation between polarity and UV absorption for the other three solvents. This was attributed to other possible causes such as hydrogen bonding. They also speculated that the solvents may swell the fibers, thus creating a more favorable environment for photo-conversion of the dye. The photochromic wool fabric developed by Cheng et al. using a sol–gel-derived silica coating showed an absorption maximum of 0.24 and 0.25 for silica coatings produced from phenyltriethoxysilane (PhTES) and octyltriethoxysilane (OctTES) precursors, respectively (Fig. 19). Similarly, Parhizkar et al. produced a photochromic fabric by applying a silica coating prepared using sol–gel processing and containing spirooxazine dye. A combination of phenyltriethoxysilane (PhTES) and octyltriethoxysilane (OTES) precursors was used in preparing the coating. The maximum absorption of the fabric was 0.32 ± 0.01. The speed of coloration and decoloration of a photochromic textile or fiber when exposed to UV irradiation is an index of color change speed, which is of importance for practical photochromic effect. The speed of coloration is expressed by the time required for absorption to increase from zero to half of its maximum level upon exposure to UV irradiation. Similarly, the speed of decoloration is expressed by the time taken for absorption to reduce from maximum to half of the maximum . These times are indicated as t1/2 and t′1/2, respectively, as shown in Fig. 20. The rate of coloration and decoloration largely depends on the matrix in which the photochromic dye is placed. The photochromic molecule requires free space in order for the photo-induced structural transformation and consequently color change to occur. Any steric effects induced by the polymer matrix can affect the speed of the dye’s transformation. Cheng et al. embedded a spirooxazine dye in five different silica matrixes via the sol–gel method to create photochromic coatings on wool fabric. The coloration times of their coated fabrics varied between 3 and 18 s and the decoloration time between 4.5 and 22 s for coatings prepared from different silica precursors. After comparing the properties of photochromic coatings from silica precursors bearing different organic non-hydrolyzable groups, they concluded that precursors bearing long alkyl chains, such as the octyl group in octyltriethoxysilane, produced better photochromic and handle properties. In another work , they compared the properties of coatings from combinations of short- and long-chain alkyl silica with 3-glycidoxypropyltrimethoxysilane (GPTMS) and concluded that the epoxy group of GPTMS improved abrasion and washing durability. Figure 21 illustrates silica matrixes bearing different functional groups with encapsulated spirooxazine dye molecule. Parhizkar et al. also produced a photochromic fabric by applying a coating consisting of spirooxazine embedded in sol–gel-derived silica produced from a combination of PhTES and OTES precursors. The resultant fabric displayed a coloration and decoloration rate of 1.6 ± 0.1 and 3.3 ± 0.1 s, respectively. In the work of Lee et al. , photochromic polyamide fabrics containing spirooxazine dyes exhibited photochromism with UV irradiation at a coloration rate of approximately 10 s (Fig. 22a). The decoloration rate which was expressed as K/S% dropped by 30–50 % within a time frame of 20 s (Fig. 22b). The coloration and decoloration of a polyester fabric dyed with spirooxazine dye is shown in Fig. 23a, b, respectively . Coloration is presented in the form of spectral changes against wavelength with duration of UV irradiation. It took 10 min for absorbance to reach its peak, and it did not change further with another 5 min of irradiation. Decoloration is shown as the color difference in the fabric between the unexposed and exposed states. The speed of response to UV irradiation can vary between different classes of photochromic dyes. Little and Christie  reported that spirooxazines faded more quickly after removal of the UV source compared with naphthopyrans. Naphthopyrans were reported to display a residual color after decoloration. They observed that different dyes within the same class exhibited similar coloration and fading rates, while these properties differed between two different classes. Photostability or resistance to photodegradation with prolonged UV exposure is another important aspect of a photochromic fabric/fiber for practical applications. Billah et al. reported that a polyester fabric dyed with a spirooxazine dye lost almost all of its photochromic effect after 10 h of exposure to UV irradiation and displayed no color change after 20 h of exposure. However, they reported that after wetting the photochromic fabric which had lost its photochromic effect, it showed color change again with UV irradiation. The photostability of photochromic polyester is shown in Fig. 24. Aldib and Christie  exhaust dyed polyester fabric with spironaphthooxazines and naphthopyrans, applied as disperse dyes. They measured the photostability of the fabric in 20 cycles. In each cycle, the fabric was subjected to UV irradiation for 4 min and subsequently bleached in the dark for 2 h. Furthermore, they measured the stability of the photochromic effect with storage by keeping the fabric in the dark for 170 days. The six studied dyes exhibited different photostability, regardless of their photochromic class, from lower than 50 % retention of the photochromic effect to as high as 100 %. The photochromic fabrics retained between 71 % and 84 % of their functionality after 170 days of storage. The order of the dye storability was not the same as that of their photostability. Free radicals have been identified as a major cause of degradation of photochromic compounds, as they readily react with the excited form of the chromophore . Oxygen (in free or radical form) has also been linked to the photodegradation of chromophores [37, 38, 39]. Different types of UV stabilizers can be used to protect photochromic compounds against photodegradation [40, 41]. These compounds work via different mechanisms including quenching, free radical scavenging, and UV absorbing [39, 42, 43, 44]. Little and Christie  screen printed some commercial photochromic dyes onto fabrics and reported that the coated fabrics had a relatively low photochromic photostability. The addition of UV absorbers increased the photostability to an extent. For one dye, photostability was increased from 150 min (for loss of half of the photochromic effect with exposure to UV light) to a maximum of 825 min by addition of a UV absorber. However, UV absorbers compete with the photochromic dye in absorbing UV, thus reducing the dye’s photo-coloration. On the other hand, the incorporation of hindered amine light stabilizers improved photostability by up to fivefold without significantly affecting photo-coloration. In the work of Parhizkar et al. , the effect of three types of treatment on the photochromic properties, including the photostability of a photochromic fabric, was studied. The photochromic fabric was prepared by coating wool fabric with a silica layer prepared via the sol–gel method and containing spirooxazine dye. The three treatments applied to the fabric included the addition of UV stabilizers to the coating, modification of the hydrophobicity of the coating using a fluorinated silane, and addition of an extra layer of silica to block the pores. The rationale behind the use of UV stabilizers was explained above. Fluorine atoms can help increase hydrophobicity and therefore prevent moisture from accessing the dye in the matrix pores, thus prolonging the life of the photochromic fabric. The additional silica helps block the pores to prevent the diffusion of moisture and other degrading elements into the matrix pores. The coating solution was prepared by hydrolysis and condensation of a combination of octyltriethoxysilane and phenyltriethoxysilane precursors with acidic catalysis. The dye was then mixed with the sol, which was subsequently applied to the fabric by dip coating. The fabric was then air-dried and cured at 110 °C. The UV stabilizers, which included a UV quencher, two UV absorbers, and a free radical scavenger, were added to the dyeing solution, where required. The fluoro-alkyl silane (FAS) was added to the solution at the beginning of synthesis, where applicable. The additional layer of silica, which did not contain dye, was prepared from 3-aminopropyltriethoxysilane (APS), 3-trimethoxysilylpropylmethacrylate (MPA), or the same silica as the first layer and applied to fabric as described above. 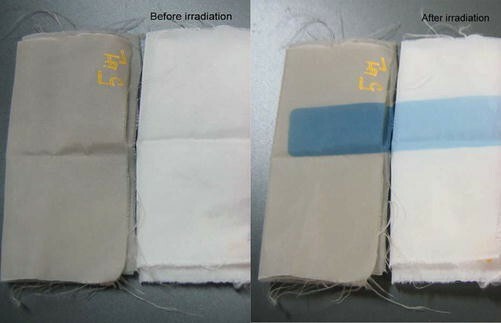 All three treatments improved the photostability of the photochromic fabric, which was measured by irradiating the fabric with a mercury discharge lamp. The photostability of the control fabric was approximately 10 h, which was improved by the incorporation of the UV quencher to approximately 90 h. The UV absorbers and free radical scavenger were considerably less effective than the UV quencher. The incorporation of fluorine atoms also did not enhance photostability significantly. Among the three types of additional silica layer, that prepared from APS was the most effective, increasing photostability to higher than fourfold. This was attributed to the presence of the amino group, which helps protect the dye from photo-bleaching . The other photochromic properties of the fabric, namely, the rate of coloration–decoloration and the absorbance, were not significantly affected by the treatments. The durability of the coated fabric to abrasion was high and the wash fastness was satisfactory. Photochromic textiles with their fascinating color-changing feature have found applications in fashion . Joshi et al. produced a color-changing umbrella by exhaust dyeing a polyester fabric with thermochromic dyes followed by screen printing of photochromic dyes onto the fabric. Similarly, they applied thermochromic and photochromic dyes to cotton fabric to produce a color-changing curtain, ornamental wall hangings, and color-changing T-shirts. They reported that their photochromic dyes performed equally well on different substrates in terms of depth of color as well as wash fastness. Minoshima and Osada  produced photochromic fibers containing a transition metal acid and a resin binder, which were suitable for application in papers for security purposes. Write  produced a security device in the form of a woven material containing photochromic yarns for such applications as product labels and identification cards. 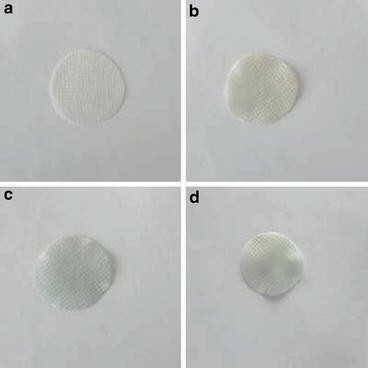 Du and Su  prepared a photochromic fabric by depositing a thin film of tungsten oxide on nonwoven polyester fabric by means of magnetron sputtering. Images of their fabric are shown in Fig. 25 and the reflectivity versus wavelength is shown in Fig. 26. They tested the temperature resistance of their fabric by monitoring the reflectivity of the coated fabric before and after exposure to 0 °C, 25 °C, and 100 °C temperature for 24 h. It was observed that the reflectivity of the sample remained almost unchanged, which demonstrated high-temperature resistance. The ultraviolet protection factor (UPF) of the fabric was also tested. It was found that the UPF of the activated (i.e., exposed to UV light) photochromic fabric was seven times higher than that of the uncoated fabric and twice higher than that of the coated fabric which had not been subjected to UV irradiation. However, the photochromic fabric in this work did not display a strong color with UV irradiation. Furthermore, the coloration and fading speed were low. The fabric was irradiated for 30 min in a high-pressure mercury lamp to change color and stored in the dark for 24 h to fade back to its original color. However, a residual yellow color remained on the fabric which disappeared after 7 days. Vikovα  developed a UV sensor based on photochromic textiles. In this work, five different photochromic dyes were applied to PET fabric. The effect of the duration of exposure to UV irradiation on color change was studied. It was also reported that the speed of coloration was higher than decoloration. Photochromic textiles also have military applications such as aircraft canopies and camouflage . Since its discovery, the fascinating phenomenon of photochromism, or color change triggered by UV irradiation, has had many different applications, including in fibers and fabrics. In this chapter, different families of photochromic dyes, methods of applying them to fibers and fabrics, and the properties and applications of photochromic fibers and fabrics were discussed. As discussed in this chapter, fast-switching color-changing fibers and fabrics have been developed. However, the high production cost and low photostability and wash fastness of photochromic fibers and fabrics have hampered their production on a commercial scale. Although the use of UV stabilizers has helped to improve the lifetime of photochromic materials, the durability properties of photochromic fibers and fabrics still require improvement to enable mass production of these materials. The exciting implications for the clothing and fashion industry can be a great incentive for further research on this topic. In this review, photochromism, its history, and recent research development especially in fiber and textile areas have been described. Different photochromic compounds and their properties have also been discussed. The state-of-the-art techniques for applying photochromic compounds to fibers and fabrics and their optical properties and potential applications have been summarized.